This session utilizes innovative exercises and unique audience break-out sessions to immerse attendees into The Asking Formula fundamentals and incorporates interactive exercises so that responsive learning is taking place. To implement the 6-steps of the most effective, straightforward and high-impact process for structuring a best-in-class “ask” regardless of audience, topic or situation. To recognize and avoid 3 common asking behaviors that sabotage effectiveness and act as barriers to success. Learn to build trust with your stakeholders and the ability to overcome resistance and shrug off rejection. A more intensive working session, with advanced exercises and deeper utilization of the methodology. Pair this full day workshop with the launch of a new product, business strategy, or key initiative. All of the outcomes noted in the 1/2 day workshop (at left). 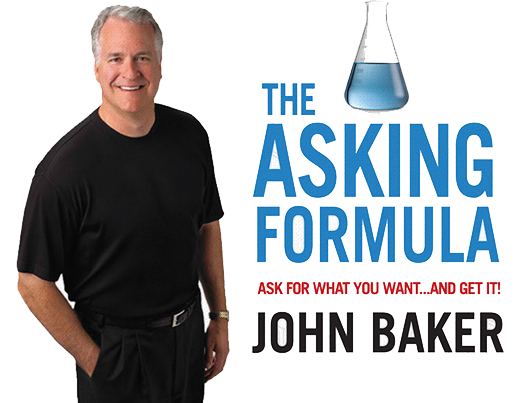 Deeper exploration of the concepts and practices underlying The Asking Formula’s six steps. Individual coaching, feedback, and corrective action during the role-playing exercise. Pre-session meeting to align on key messages, potential issues, and audience dynamics. Web-based “Asking Assessment” for attendees to complete, prior to the workshop, to determine their readiness to be a strong, effective, confident asker. Click the video link below to watch highlights of John’s workshop.